The Flexibilis Redundant Switch is applicable across a range of applications that demand high availability, Gigabit class data transfer capacity and sub-microsecond timing accuracy. Target applications include smart grid substation automation, networked industrial automation gear, high availability network equipment, motion control, as well as transportation like aviation and railway. Reliable and fast communication generally leads to cost savings and more efficient operations. Many critical applications require a network with zero downtime. HSR provides redundancy with no single point of failure and zero time to recovery in case of a failure. The network is fully operational even during maintenance, as any device can be disconnected and replaced without breaking the network connectivity. This makes the network very reliable and highly available. HSR provides much better redundancy than the Rapid Spanning Tree Protocol (RSTP) which has failover times that will increase with the size of the network. HSR is also more cost-effective than the older standard, the Parallel Redundancy Protocol (PRP), because HSR requires significantly less cabling. Therefore HSR can be considered the most effective redundancy solution available for Ethernet at the moment. The Flexibilis Redundant Switch, being an IP block, provides high integration on a circuit board, as the use of programmable hardware makes it possible to have more functionality in one chip. By purchasing a ready-made, verified and field-proven technical solution, a lot of time and resources can be saved, enabling faster time to market, as well as fast return on investment. The Flexibilis Redundant Switch can be evaluated for free for an unlimited time period, so you can easily test it with your own hardware and application. Upgrades, maintenance and technical support are all available, as well as very useful “Getting Started with FRS” training package. The training will help you to choose the correct functionalities for your needs. See also who already uses FRS. 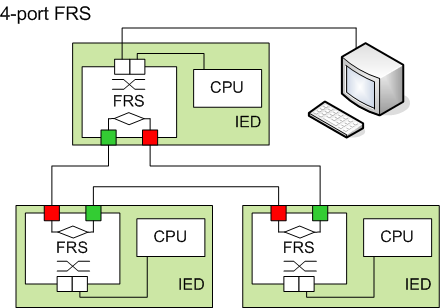 Intelligent Electronic Device (IED) implementation requires at least three ports – two external for the HSR ring and one for a CPU. However, if you add one external port so that you have three external ports in total you can integrate a RedBox into your IED. This minimizes the total number of devices in the network because separate RedBoxes are no longer needed. 4-port FRS has three external ports and one for CPU. The fact that your customers won’t need a separate RedBox will significantly reduce their cost and make your IEDs much more appealing to them. FRS IP is freely configurable from 3-port to 8-port for FPGAs, so why settle for 3-port?